Ask fellow campers about "Perkins RV Park" and nearby attractions. 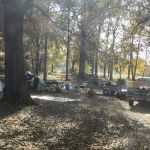 This is a simple park with full hook up, clean and neat, yes their are some cluttered permanents but it is convenient to town and the owner is on sight to make sure every thing is as it should be. A perfect place to be convenient to Jonesboro We camped at Perkins RV Park in a Motorhome. Very easy to reserve, and they helped us to find our pull-through spot and get set up when we arrived. They gave us local area recommendations, and we enjoyed a nearby dinner. We were only there one night, passing through, and it was a great value. Quiet, clean, and easy to get in and out of. We were not there to camp long term, so we weren't concerned with facilities or amenities. We would stay there again for sure. We camped at Perkins RV Park in a Travel Trailer. My family and I have stayed here a few times with our pets while visiting relatives. There is a few pull through spots in the front that we use. They're near the road but it's not to bad. We call to let them know when we will be arriving and everything is always taken care of. We don't use amenities because we are running around with family. It's convenient to shopping, churches, hospitals, gas, and many more things. If you are wanting ritzy then this might not be your place. If you are wanting convenience and nice people, it's exactly where you want to come. If we are able, we will stay here when in this area. Thank you Perkins RV for the kindness we have always received. We camped at Perkins RV Park in a Motorhome. Food, Craigshead Park, hospital, and church very near. Got a site. Site was new but was it prepared properly. Buried my motor home to the bed. Cost $200.00 to get pulled out. Had to change sites in the rain. We camped at Perkins RV Park in a Motorhome. 1 overnight stay. 1 back-in 50 A site left & we got it. Our site was on the outside edge of the park next to single wide mobile homes. Neighbors were friendly and helpful....offered a flashlight for our hooking up at dusk. This park is in need of lawn/tree maintenance. Gravel site, level enough with the levelers making it right. FHU. Cable did not work. Mostly a long term CG/mobile home park. The owners daughter was on duty and was very helpful and accommodating. This was a pleasant experience and we would stay again if in the area. Very easy access from/to the interstate. We camped at Perkins RV Park in a Motorhome. We have been staying here monthly. The park is quiet and convenient. The owner is on site every day and keeps the park clean and neat. It is great for what it is, a place to park while visiting Jonesboro. We camped at Perkins RV Park in a Fifth Wheel. This is a nice little park. Owner was very nice. Large site with plenty of room. The rate was the weekly rate. We will stay there again. We camped at Perkins RV Park in a Fifth Wheel. Liquor stores are about 12 miles away, Jonesboro is a dry town..
Perkins is not a 'glamorous' park, but it excels at what it is. It is a place for long-term transient workers or 'snowbirds' to stay. When you are used to 'Good Sams' parks and resorts, you may be wary about staying here, but don't. It is a nice, quiet park with friendly guests and owner. The property has an RV side and a Mobile Home side. Althought there were several homesteaders (RV's with huge external propane tanks and residential refrigerators/freezers outside) they were all well kept and appear to be in good repair. There were several overflowing garbage drums around the park, but I believe the owner was busy keeping the grass mowed and just got behind. He is a nice fellow, and was very busy, allowing me to just drop a check through the mail slot when I got a chance. They DO NOT take credit cards. I wasn't bothered by the road noise, but we didn't spend much time at/around our site, and it never woke any of my family up. The water spigot has a 4-head adapter that feeds different adjacent spaces, but we never had any pressure issues. The sewer hook-up never back flowed, but did leave our downspout messy. The other issue I had was with the 50-amp service. It was just a plug and NO breaker: a cable running under the pine needles. I prayed, plugged it in, went inside, restoring the circuit breakers, everything worked, but it was a bit unnerving. The cable TV worked great, but we only watched the Weather Channel due to tornadoes in the area. No Wi-Fi but my Sprint phone and Verizon Aircard worked fine in 3G mode. There are phone company demarks at each space, so you could get a phone line and DSL if you are staying for a month or more. This park beats staying in a Wal-Mart thanks to the hook-ups and level spaces, so do not hesitate to stay at Perkins, despite its 'dated' look. We camped at Perkins RV Park in a Motorhome. Park is located with easy on and off Hwy access but does have a lot of traffic noise. Sites are level and have good drainage, but narrow. They do not have any showers, bathrooms or laundry on site. There are many permanent RV'ers living on the premises who are very friendly. The owner is helpful and very nice. The park is conveniently located near many stores and restaurants so you can shop and eat until you drop. BYOB as it is a dry county. We camped at Perkins RV Park in a Motorhome. This park works as an overnight stop. It's right next to a very busy highway and is extremely noisy between 5am and midnight. The owner is friendly and helpful but this is a very old park with mostly permanent residents and reflects that in appearance. If you're tired, it's after dark and choices are limited (and they are in this area) then it works fine. We camped at Perkins RV Park in a Fifth Wheel. This park is right on the highway and is great for an overnight stop. It's mostly long term trailers but the few spots they have open are level, full hookups with cable. No Wi-Fi at all. We camped at Perkins RV Park in a Motorhome. Convenient as it is right off the highway, although you can hear the buzz of the highway when outside your rig. Nice camp hosts. There are few shade spots but there is a forested area with a small pond that you can fish in, but I cannot vouch for fish since I didn't try to catch any. Not all sites are 50 amp and not all sites are full hook-up. Great place to stop if you are passing through and want to leave first thing in the morning. We camped at Perkins RV Park in a Travel Trailer. Are you affiliated with Perkins RV Park ?